Tempeh sausage sizzles in a thick red sauce. Alongside it a pot of yellow polenta gurgles, the blueish flame it’s set upon wavering as I walk by. My striped, wood-block counter is an explosion of CSA vegetables, sweet potato scraps, and tomato and nasturtium sprouts in little black plastic pots. Cold rain has melted the electric pink azalea blooms out front, turning them a pallid, wilting salmon pink. The sun sets and turns the yard purple-blue. Logan and I settle into steaming bowls of polenta, roasted sweet potato and tempeh — loosely chopped fresh basil threaded throughout. Sitting from our long couch, we can look out of our wide living room window at the nascent green cherries on our cherry tree -- knocking together with a gust of wind. Most nights Logan and I sit down for a distractions-free meal so we can talk and be present with each other. Even if that’s only for 10, 20 minutes. That time spent together, that’s as much food as is the meal we share. You know, spirit food. If I go too long without it I start to feel starved in a way. I think we both do. Setting down for a big bowl of spicy, creamy, savory comfort food and conversation with my love is basically a much-needed bear-hug at the end of the day. Polenta, tempeh sausage and sweet potatoes all live in the comfort food zone for me. I can easily batch prep all three and make enough for multiple meals, too. And, all in all, the process for each is easy. My tempeh sausage method has morphed over the years. I used to loathe tempeh. And I especially disliked the long-process methods it took to make it taste semi-ok. In 2012 the only method I knew involved brining the tempeh for 8 hours prior to cooking for an hour. As you can imagine I quickly abandoned that for, well, not eating tempeh. A year or two later I figured out what is now my go-to method. It’s improved over the years. And now it really feels blog-worthy due to some recent tweaks. I do a steam-sauce-sauté prep. That is, I slice or cube my tempeh, steam it with 1 cup water until the water has boiled off, then add my flavorings and sauce ingredients (e.g. smoked paprika, garlic, oil and bbq sauce) and cover until the liquid has cooked down. Then I remove the cover and continue to cook, flipping the tempeh as necessary, until the tempeh begins to brown. It takes about 25-30 minutes. But most of that is just waiting around for the water and sauce to cook down. It's the fastest and easiest way to make tempeh taste pretty damn good. Recently I started adding rice-vinegar to the water that the tempeh steams in. For whatever reason that kick of acid makes the tempeh taste phenomenal in the end. I mean, it was good before. But now? Legendary. It’s almost as if the sauce sinks more deeply into the tempeh slices. It's the most meat-like of a flavor I have yet stumbled upon in my plant-based kitchen. Oh yeah, and you know by now that not all tempeh is created equal, right? Well, if you don't here are some tips! Best quality tempeh should smell like mushrooms and fresh bread. If you're gluten-sensitive, make sure to check your tempeh package ingredients as barley is often added to commercial varieties. Always buy Organic tempeh, as soy is one of the most GMO contaminated foods. Get it fresh! Check the "use by" date on the package and get the freshest one you can. Buy local if possible. A lot of American states now have one or two small purveyors of hand-made tempeh. In google, look up your state name + tempeh. I use this Virginia brand. This bowl is a typical nightly meal for me lately. Gochujang tempeh sausage. Pre-made polenta (the kind you get in sausage-like tubes) made cheesy-savory with nutritional yeast, salt and pepper. Sweet potatoes (from my batch-cooking prep). And tons of basil. The whole meal took me about 35 minutes to make because I got the sweet potato roasting while the tempeh was cooking on the stove. The polenta gets going at the same time as well. If you make this recipe or a variation, tag me on instagram with #willfrolicforfood so I can see! This tempeh sausage recipe is easy, approachable and delicious! The trick is steaming the tempeh in water with 1/4 cup vinegar before adding sauces. Add the tempeh to a large sauce pot with a lid. Add 1 cup water and rice wine vinegar, cover and set the pot over medium-high heat. Bring to a boil. Set the lid ajar at 10 minutes to release steam. Cook until all of the water has boiled off, about 5 minutes more. Remove the lid and add the coconut oil, tamari, gochujang / sriracha, tomato paste, maple syrup and pepper. Add 1/4 cup water and stir everything together to coat the tempeh with the sauce. Cover with the lid slightly ajar and cook 10 minutes more, stirring occasionally. Continue to cook until the sauce has been absorbed into the tempeh. Remove from heat but leave the lid on until ready to serve. Spread the sweet potatoes out on a large baking sheet lined with parchment paper (don’t worry about overlapping). Bake for 30-35 minutes, until fork tender. Remove from the oven and set aside to cool for 5 minutes before serving. Slice up / break up your pre-cooked polenta and place it in your sauce pot. Add the nutritional yeast, coconut oil, salt and pepper to taste. Pour in the water and stir. Cook covered over low heat for 5 minutes (or until the polenta softens up) and stir everything together. Add more water as needed to get a smooth consistency. You can even use an immersion blender for this if you're averse to tiny lumps in your polenta. 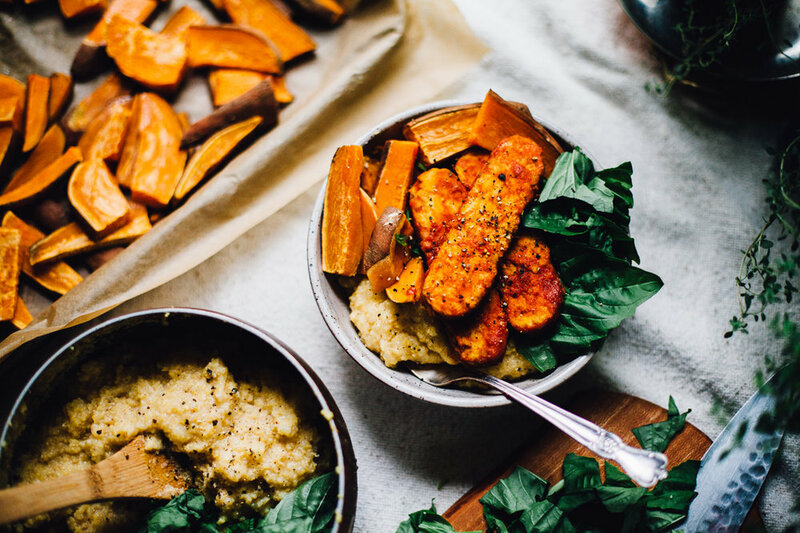 To serve, add polenta, sweet potatoes, a handful of fresh chopped basil and your tempeh sausage to your bowls. Dig in!